Quick, easy dinners are not only the best but often a necessity. This soup is one the easiest ones you’ll ever find. Made with kabocha squash and miso, this soup is inspired by Japanese flavours, but you don’t need anything fancy to make it. Kabocha squash is one of our favourite types of squash- it has a delicious earthy and subtly sweet taste that is richer than butternut squash. This recipe is also very forgiving: feel free to switch out the green onions for 2 to 3 Tbsp of chopped shallots or yellow onion. We originally used green onions in this recipe because they are lighter than yellow onion (and we wanted this soup to be light and not have a strong onion taste). 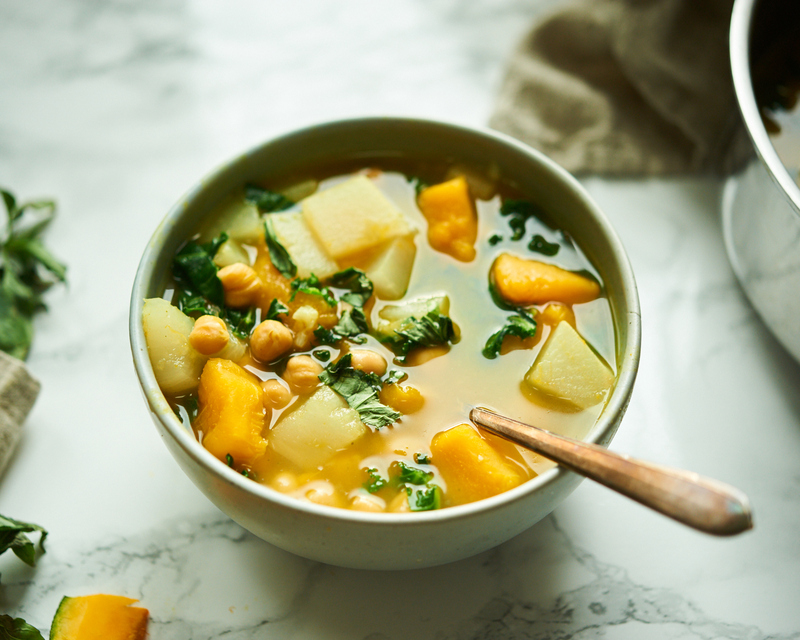 You can also omit the chickpeas if you prefer a vegetable only soup or even sub in a different type of bean, such as white beans or adzuki beans. And, don’t forget the miso, the important flavour enhancer as well as digestive supportive ingredient that provides lots of beneficial bacteria. We love using miso that’s made from chickpeas because it’s soy free. But, if you can eat soy, then you can use normal miso made from soybeans (get organic!). 2. Add the veggies and chickpeas to a pot and cover with water. 3. Bring to a boil and then reduce to a simmer. Simmer on low heat for around 30 minutes, until the veggies are soft and cooked. 4. Turn off the heat. Then stir in the kale and let it wilt in the hot broth. 5. Scoop out around 1/2 cup of the broth into a mug or bowl. Mix in the miso so that it’s dissolved. Then pour this back into the pot and stir into the rest of the soup. 6. *Don’t boil the liquid after the miso has been added in (the heat destroys the good bacteria that’s found in the miso). If reheating any leftover soup, heat gently but don’t boil. Alternatively, you can add a spoonful of miso to each individual bowl of soup instead of adding it into the large pot.